One of the first words a child learns to recognise, and then to write, is his own name. 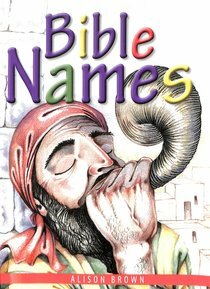 He identifies not simply with its shape and sound, but often with its origin, especially if he shares it with someone he loves and respects.Bible names were often derivatives of Greek or Hebrew words of very significant meaning. Some were chosen by the baby's parents as an expression of their hopes for its future, while others were given, or changed, by God himself in order to describe a new identity that he wished the person to embody.Bible Names, written for the primary age-group, presents simple biblical truths about God's promises, repentance, faith, and obedience, using the lives and names of some well-known Bible characters, presented in chronological order. Some activities are provided to help children recap the main facts in each lesson. *Bible Names is a sequel to A Bible Alphabet, Bible Numbers and Bible Animals which are also published by the Trust. About "Bible Names: Presenting Gospel Truths to Little Children Using Bible Names and Their Meanings"
Alison Brown is a Senior Lecturer in the School of City & Regional Planning at Cardiff University, and an urban planning consultant specializing in international planning practice. She is course director for the MSc in International Planning & Development, and has undertaken extensive research and consultancy in the developing world--in Southern and West Africa, South Asia, and the Middle East. She has recently managed a Department for International Development-funded study on street trading and livelihoods on which the book is based.